I have sworn not to share my marinara recipe, as the guarding of sauce recipes is almost as much of a tradition as the seven-fishes feast. When making your own, keep in mind that simple is better when you're combining it with the strong flavors of crab. If crab isn't available where you live in the winter, make the traditional version of this dish instead: with lobster tails, preferably the small, delicate langostini. Bring water in a large saucepan or stockpot to a boil, then add the pasta and cook until al dente. Drain and arrange on a large serving platter; drizzle with a bit of olive oil to keep the pasta from sticking together. While the pasta is cooking, pour the marinara sauce into a large saucepan and simmer half of the crab meat in it; the crab meat will flavor the tomato sauce. Place the other half of the crab meat in a small covered baking dish, dabbled with the water to keep it from drying out, and keep warm in the oven at 250 degrees until ready to serve. 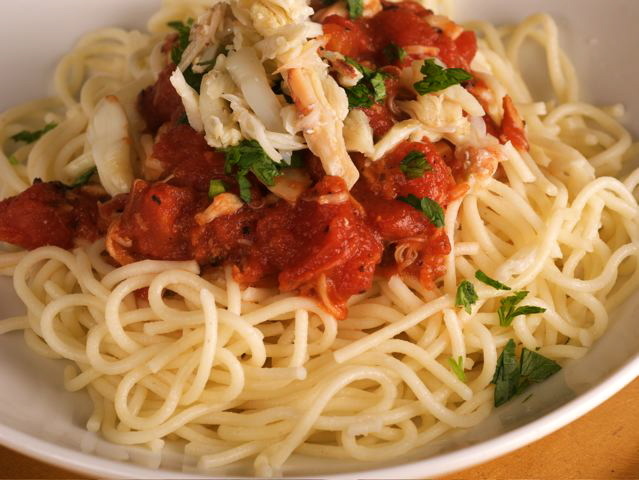 Ladle the crab-steeped marinara sauce over the pasta and top with the lump crab meat and parsley. Pass at the table with a [%amazonProductLink "pasta fork" asin=B0006G0FS0] or tongs for easier serving.